This board is almost ready to manufacture. This board is ready to make. 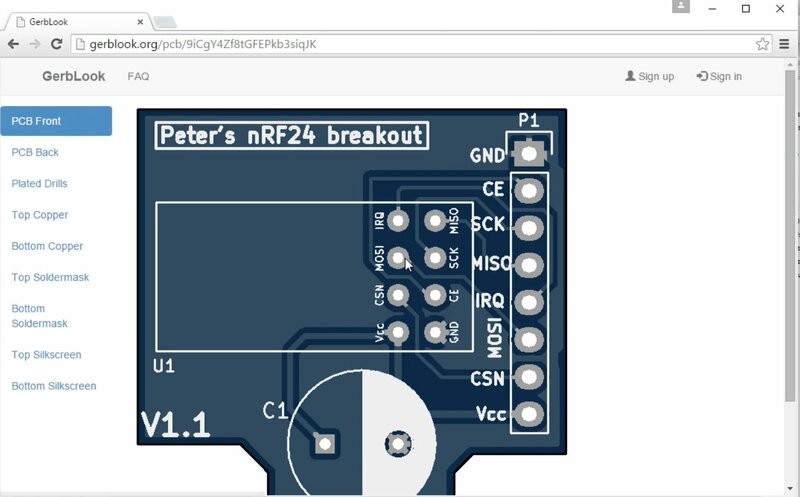 Before I upload it to the manufacturer, why not put your name on it, or the name of the board? 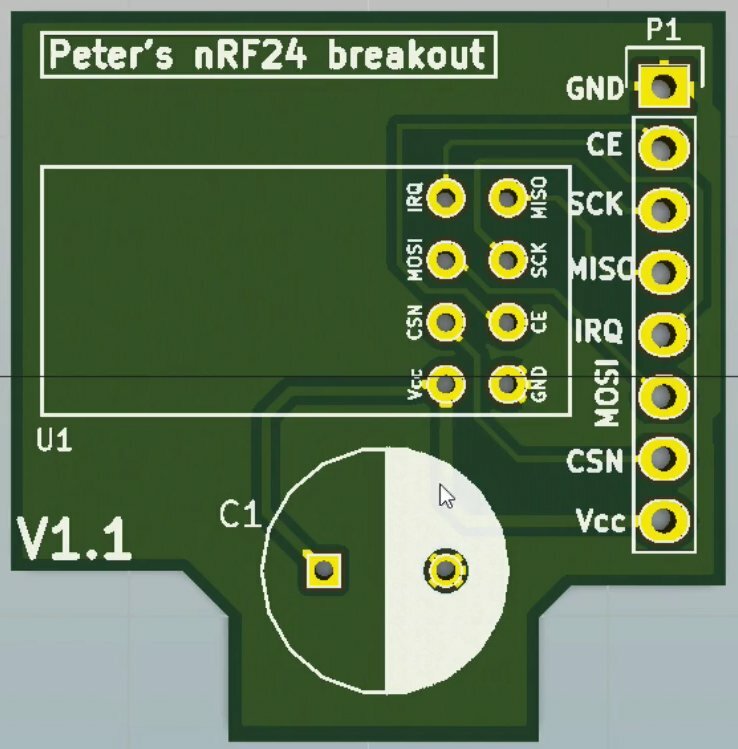 Switch to the front silk screen and use the text tool to type in the name of the board, perhaps let’s call it Peter’s nRF24 Breakout. Or you can put your name on it. Choose the Front Silkscreen (“F.SilkS”) layer to add some text. The name of the board with a box around it. You can also put things on the bottom silk screen layer. 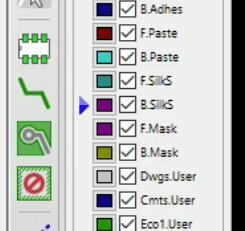 Select the B.SilkS layer to add text to the back layer. 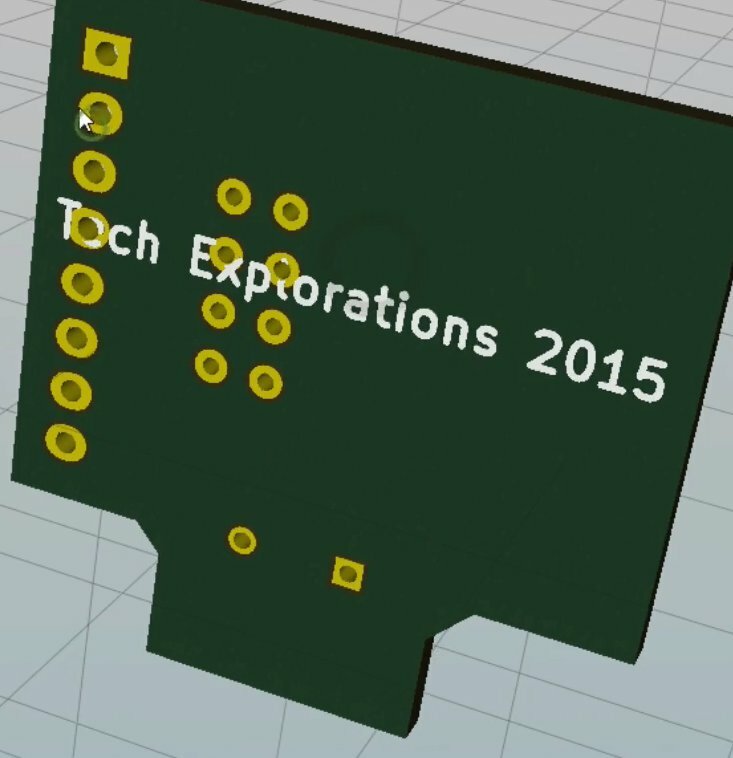 You can print something like “Tech Explorations”, and the date your designed your PCB. The text in the back silkscreen layer is represented in mirrored purple text. 3D view of the front layer. 3D view of the back layer. You can also put graphics on your board. I will show you how to do that in next chapter. 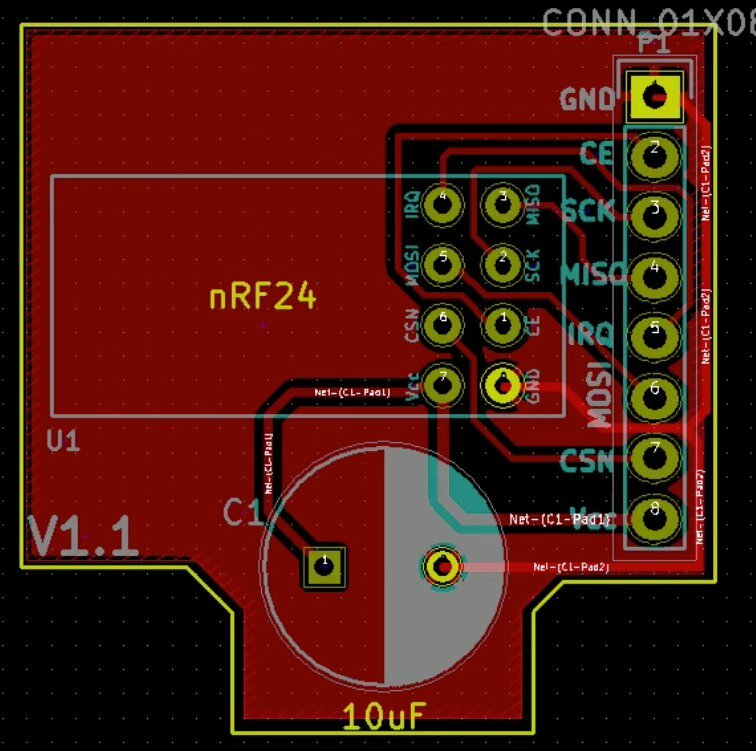 You might want to read that chapter first before actually uploading this PCB to the manufacturer, if you’d like to include graphics with your finished, made board. Click on the Plotter icon to generate the Gerber files. 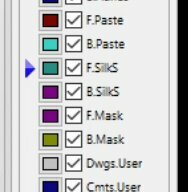 This screenshot contains the appropriate settings for manufacturing the project board. 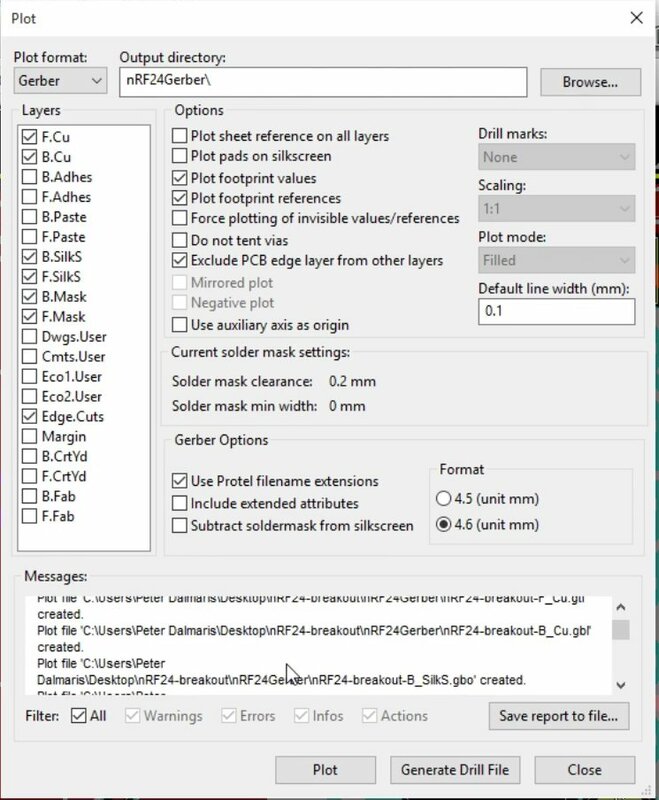 In the Gerber Options group, choose the Protel filename option. For the output directory, choose a new directory inside your current project directory. 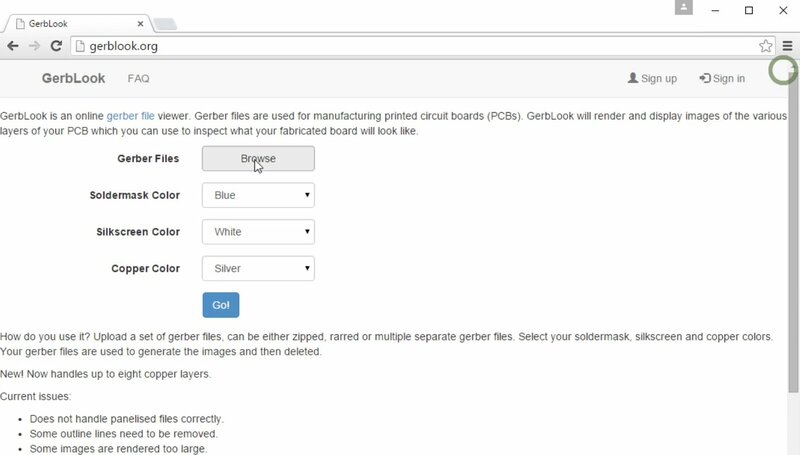 Create a new directory for the Gerber files. Place it inside the current project directory. Next, click on the plot button and to generate the Gerber files for the layers. 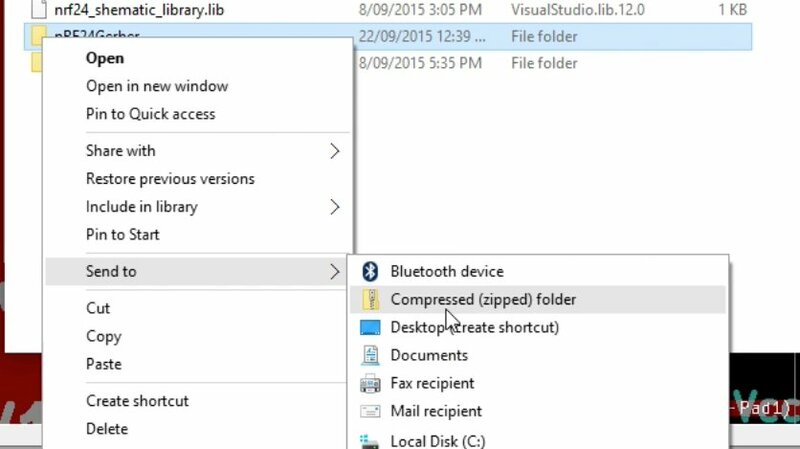 Notice that the output directory is a sub-directory inside the current project directory. 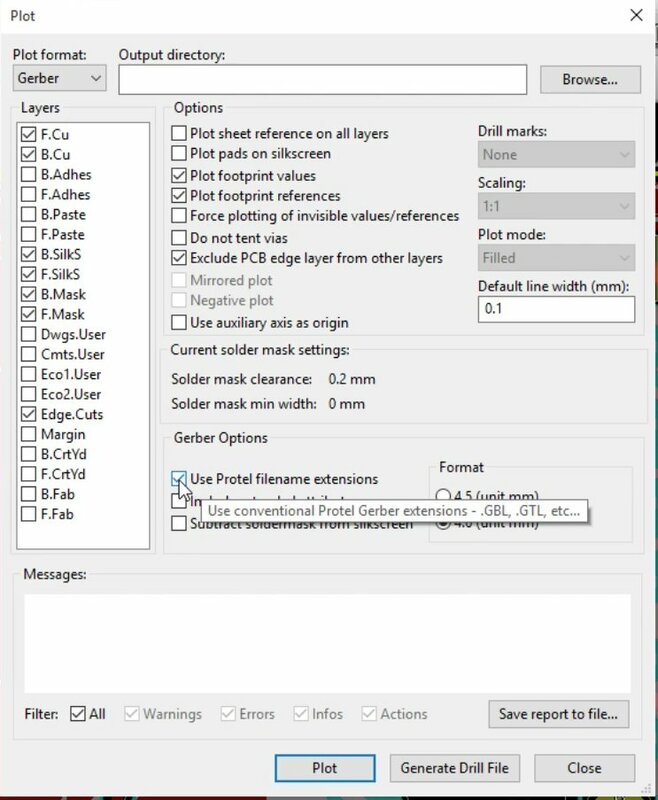 After clicking on the Plot button, information of the files that were created will appear in the Messages text box. Next, we must also generate the drill file. The drill file tells the manufacturer where to drill for the pad holes on the PCD. Click on the “Generate Drill File” button. 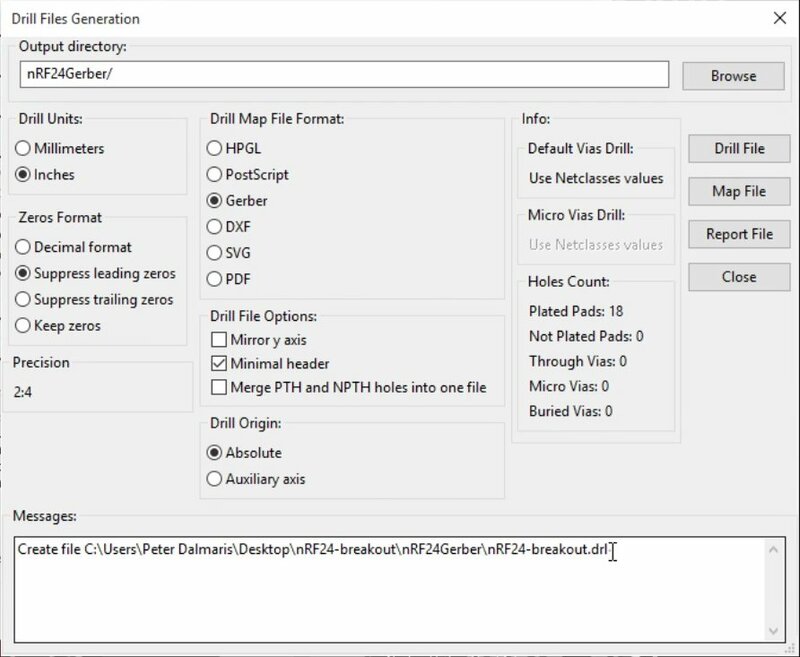 The Drill Files Generation window. This will bring up another dialog box. All the settings should be correct by default, including the output directory. 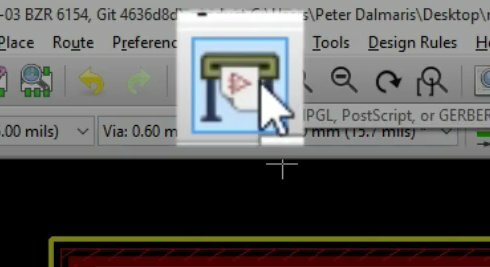 Click on the Drill File button, and this will generate the drill file with a “.drl” extension. You can close the Drill Files Generation dialog, and then close the Gerber Plot window. Have a look inside your Gerbers directory. Let’s inspect what we have. Inside the Gerbers directory you can see all the files that we just generated. We can now upload those files to the manufacturer. Before that though, we should make sure there are no errors. There is a very handy free service that we can use for this purpose, GerbLook.org. To upload our Gerber files to GerbLook, we first must create a Zip archive. 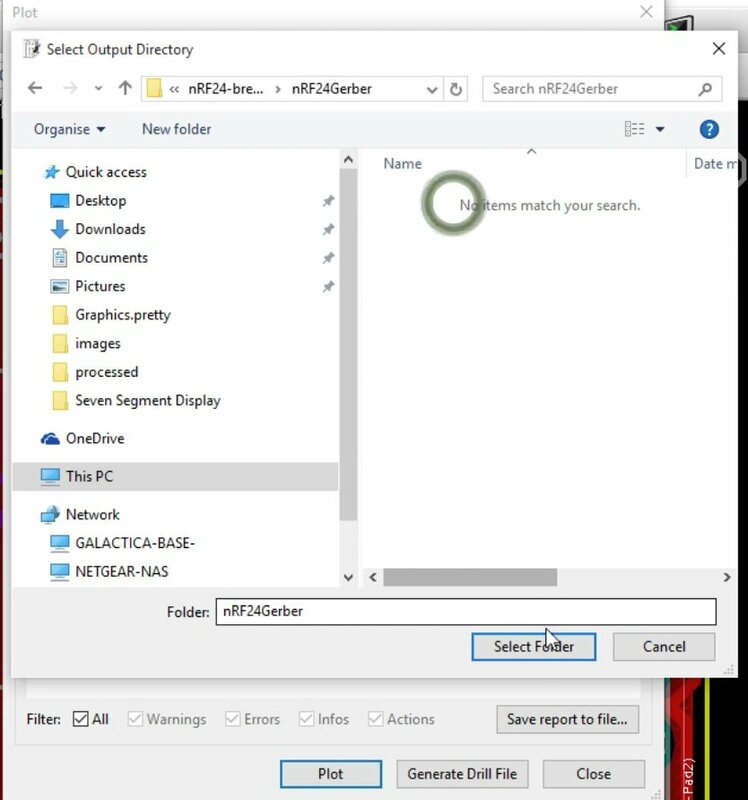 Create a ZIP archive from the Gerber directory. Use your browser to go to gerblook.org. Then upload your Gerber ZIP file to the service. Go to gerblook.org and upload your Gerber ZIP archive. If everything goes well, Gerblook will show you a render of each layer. 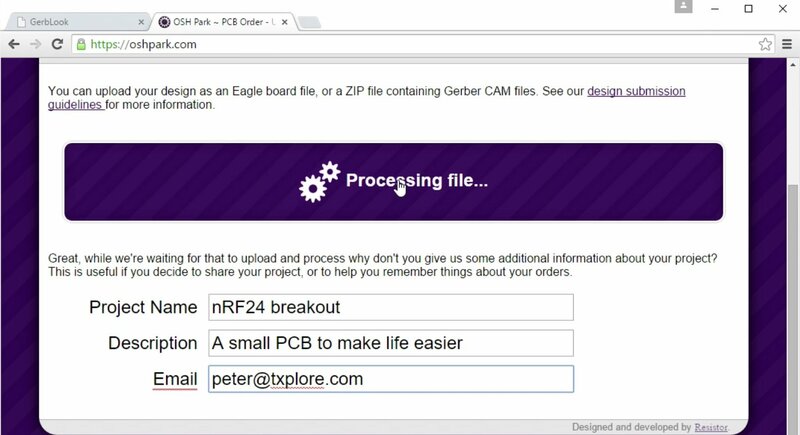 Now, I am confident to go to OSHPark and start my ordering process. 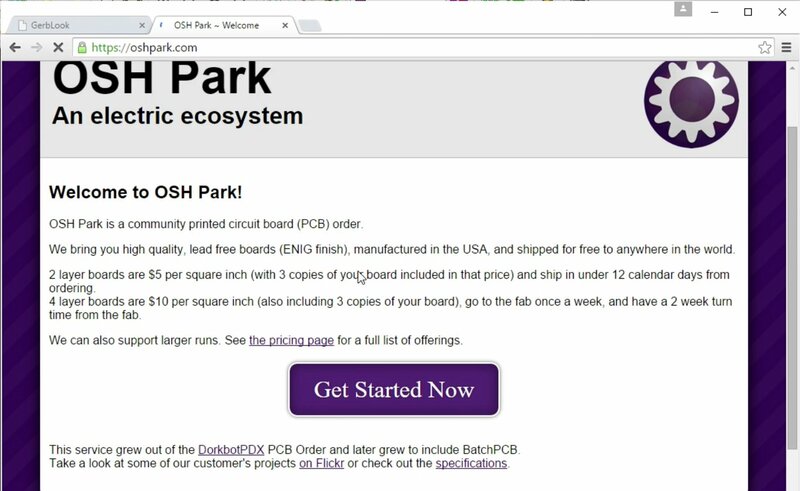 Go to oshpark.com. The OSH Park home page. Click on Get Started Now. Select the ZIP archive that you created earlier and start the upload. While the file is uploading and processing, you can fill in the project information. If everything goes well, once the processing finished, OSH Park will show you the layers that make up your board. On the left you can see the OSH Park preview representation of the board. On the right, the actual board. Okay, so it’s finished uploading and processing. We can see the front and back of my new PCB. If you are happy with what you see, you can proceed with the order. 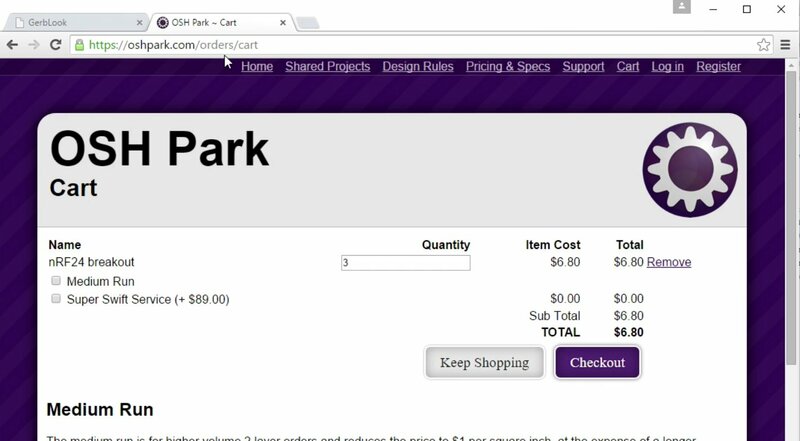 At the timing of writing, OSH Park’s pricing is among the most competitive in the industry. At the time of writing this book, the cost for this board was US$6.80, a competitive price. 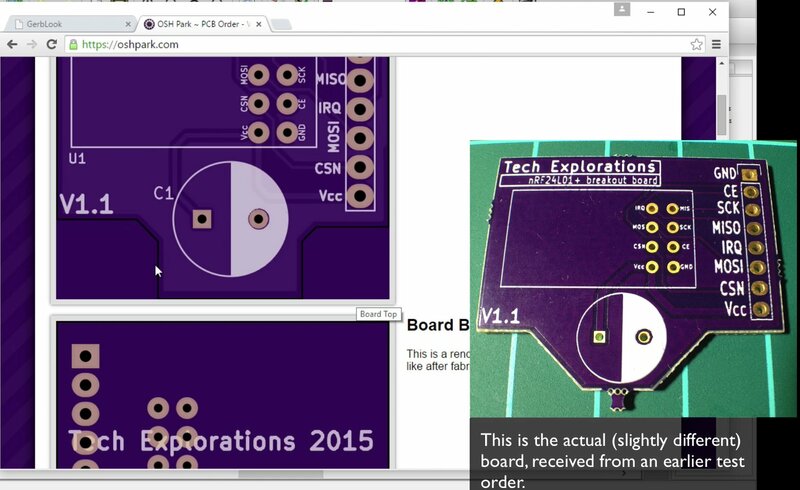 In the next chapter, I’ll show you how to add a custom graphic in order to decorate your PCB using the silk screen.